Slow down. Not Royden, you the reader. Remember this isn’t the usual over-wordy, snarky dialogue comic book. This is storytelling decompressed. Lepp uses his words like salt, just a pinch to spice up the pictures. Savour those images because even at 215 pages this will fly by. In this penultimate volume we have turned a corner and the answers are coming thick and fast. We start with a flashback that sets up the final act and brings the last few characters into play. As our charming protagonists are hanging by a thread you genuinely fear for their future. No amount of optimism and determination can stand up to the coming storm and you know the final volume is going to be electrifying. This book cements the arc of Lepp’s tale and you see he has understood the bigger picture from day one. This isn’t a sporadic idea muddling through but something that began as a polished and tightly plotted narrative. 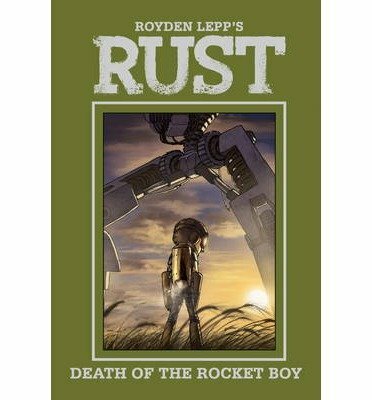 This volume is true to the Rust themes and the minimalist style strips away everything that could distract you from the heart-aching emotions of living characters. The art as always is perfect. No two pages have the same panel layout and the undulating frame count signals Lepp’s mastery of time and narrative. As he provides both the words and pictures everything fits together like clockwork. If you are interested in anything artistic look at how the characters are placed in the frame, see how the pictures reveal more than the words and do so effortlessly. This entry was posted in Graphic Novel and tagged DOUBLE Thumbs Up! !, Royden Lepp by 365gn. Bookmark the permalink.